Bookings have now closed for this Trivia Night. We will let you know when we open bookings for our second Trivia Night for 2019. 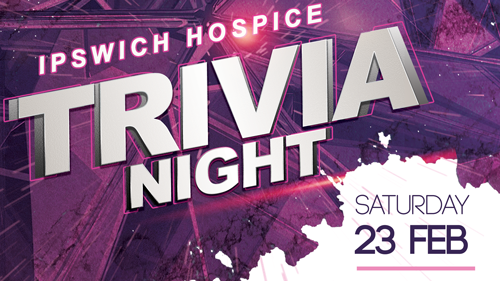 Get excited for the first Ipswich Hospice Trivia Night of 2019! A night of trivia, games, prizes, refreshments & a raffle! Doors open at 5:00pm with Trivia starting at 6:00pm in the Corporate Centre at North Ipswich Reserve. $15 per person or only $140 for a table of ten! There will be a prize for the best themed table- so get your decorations and costumes ready! The venue will open at 5:00pm for you to have enough time to decorate your table! Beer, wine, soft drink and food will be available for purchase.